In this study, it was found that knowledge of treatment by the parent did not appear to contribute to the observed treatment effects. This was a major criticism of earlier colic studies, and thus may help support their conclusions. That study revealed that excessively crying infants were 5 times less likely to cry significantly, if they were treated with chiropractic manual therapy, and that chiropractic care reduced their crying times by about 50%, compared with those infants provided solely medical management. Background: There is a small body of published research (six research studies and a Cochrane review) suggesting that manual therapy is effective in the treatment of infant colic. Research from the UK has shown that the costs of NHS treatment are high (£65 million [USD100 million] in 2001) with no alleviation of the condition. Objectives: The objectives of this study were to: investigate the cost of the inconsolable nocturnal crying infant syndrome which is popularly known as infant colic in the first 20 weeks of life, estimate the costs of different types of treatment commonly chosen by parents for a colicky infant for a week of care or an episode of care, investigate the cost of chiropractic manual therapy intervention aimed at reducing the hours of infant crying alongside a randomized controlled trial (RCT) showing effectiveness of treatment. Design: Economic evaluation incorporating a RCT. Methods: A cost analysis was conducted using data from a RCT conducted in a three-armed single-blinded trial that randomized excessively crying infants into one of three groups: a) routine chiropractic manual therapy (CMT), b) CMT with parent blinded or c) no treatment control group with parent blinded. 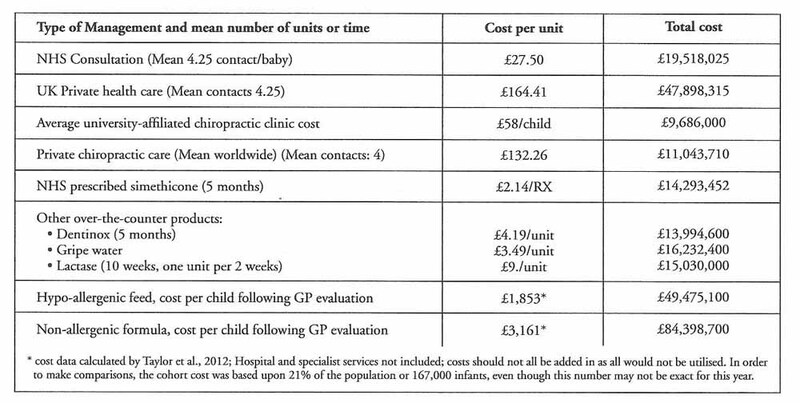 These costs were compared with costs of caring for infant colic from Unit Costs of Health and Social Care, UK, 2011. It has been widely estimated that 21% of infants in the UK present annually to primary care for excessive crying and this calculated to 167,000 infants (to the nearest 1,000) used in the cost analysis as there were 795,249 infants in the UK in mid–2010 according to the UK Office of National Statistics, 2011. Results: 100 infants completed the RCT and this resulted in treatment costs of £58/child ($93). An additional cost of GP care of £27.50 was added for initial evaluation of the general health of the child and suitability for chiropractic management, totaling £85.50 per child in the RCT. Clinical outcomes are published elsewhere, but care showed both statistically and clinically significant efficacy in reduced crying time by an average of 2.6 hours, resulting in a crying time of less than two hours a day (reaching "normal" levels which could be classified as non-colic behavior). Cost per child's care was £85.50 extrapolated to £14,278,500 for the full cohort of 167,000. If chiropractic care had been given privately, costs were calculated as £164/child per episode of care and this equaled £27,388,000 for the entire cohort. Medical costs through a normal stream of care amounted to £1,089.91 per child, or £182,014,970 for the cohort (including all costs of care, not just NHS). No benefits of effectiveness were accrued from any of those types of treatment. If the Morris NHS data were extrapolated to 2010, applying wage inflation, the cost would be £118 million (USD180 million) yearly. An episode of an average of four treatments of chiropractic manual therapy with documented efficacy of CMT cost from 8% to 25% of NHS care or routine care. Conclusion: Chiropractic manual therapy was a cost-effective option in this study. A much larger randomized study of routine medical care versus routine chiropractic care is recommended to determine whether there is confirmation of these findings. As effective treatment for children with infant colic remains elusive, the costs of managing the condition is gaining increasing attention. Although it is uncommon for clinicians to be quizzed about the cost-effectiveness of their treatments,  particularly where the clinicians’ services are covered by a national health plan, it is increasingly appropriate to ask this question, when prudence in health care expenditure is required. Cost-effectiveness has been defined as the incremental cost required per additional unit of health benefit produced as compared with the next most effective treatment. This issue is influenced by the seriousness of the condition under treatment, the costs of the condition if untreated, the efficacy of the treatments, durability of treatment along with patient satisfaction with the treatment. Parents choose specific therapies for their child and all have a cost, some easier to identify than others. However, the Morris (2001)  cost assessment was non-specific as it used only visits to GPs and Health Visitors and only the actual amount of time used to discuss crying problems. Further, the calculations were made for all children born in one given year. A cost assessment using the proportion of infants afflicted with the condition called infant colic using the type of resources parents routinely access is appropriate. An array of treatments for infants with colicky symptoms are chosen by sometimes desperate families. Parents access midwives, GPs, nurses, emergency hospital based services, pediatricians and CAM practitioners. Therefore, it is appropriate to investigate a cost analysis of the condition which includes the variety of treatments without any evidence of efficacy, chosen by parents, along with specific calculations for a type of treatment which has shown some effectiveness, manual therapy. One useful way to determine cost is to follow the costs of care as they occur in a randomised controlled trial. This study endeavored to investigate these costs. investigate the cost of chiropractic manual therapy intervention aimed at reducing the hours of infant crying relative to a randomised controlled trial showing effectiveness of treatment. Unfortunately, there is a risk for maltreatment in these cases and a recent report states that this affects 6% of excessively crying infants. It must be noted that excessive crying is the chief reason that parents give for maltreatment of their child and the child less than one year of age is the most commonly abused member of society. Therefore this is also included in the calculations and presented as an average of cost per child when spread over the entire cohort. Because each cost is independently calculated, there is flexibility in choosing which therapies or issues are appropriate in any individual case. For example, costs of hypo-allergenic formula were calculated for only 5% of the colic population, as this was thought to be realistic considering the estimate of 5–15% occurrence of milk allergy in the young population. However, NHS guidelines suggest a week’s trial for all colic babies under clinical guidance and this number is calculated as well. Also, the figure of 1% of colic children was used to calculate the costs of non-allergenic (amino acid) formula. All are appropriate as it is realistic that 5% of the population may require a full course of hypo-allergenic formula and NICE guidelines recommend a week’s trial for all colicky infants, and a small percentage require non-allergenic formula. The clinician may decide which are most appropriate, although realistically, all these costs may be incurred. 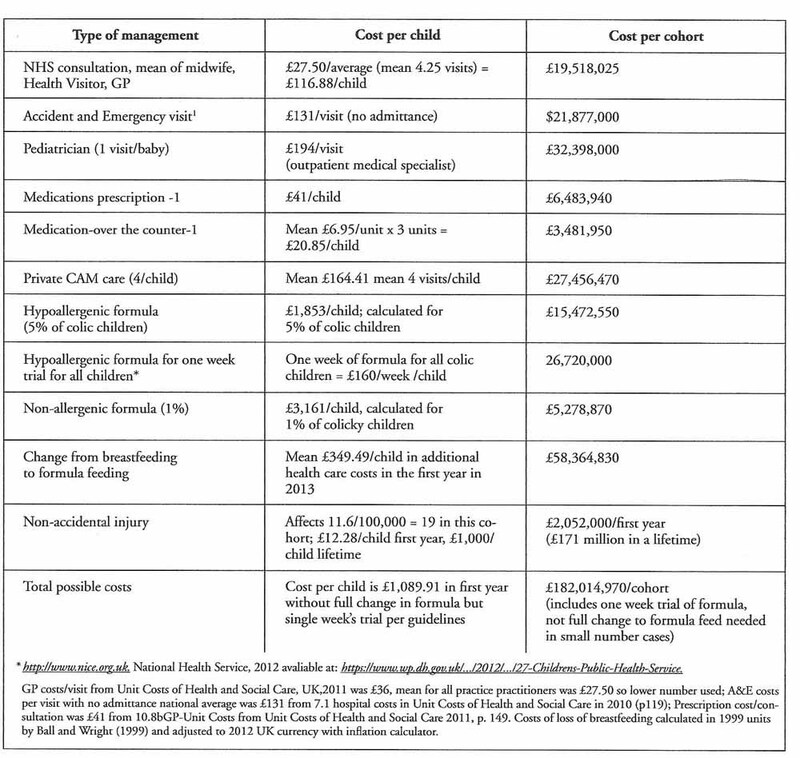 Table 1 estimates potential costs for a cohort of infants with infant colic in the UK. According to systematic reviews of treatments for infant colic, these treatments resulted in no significant recovery. 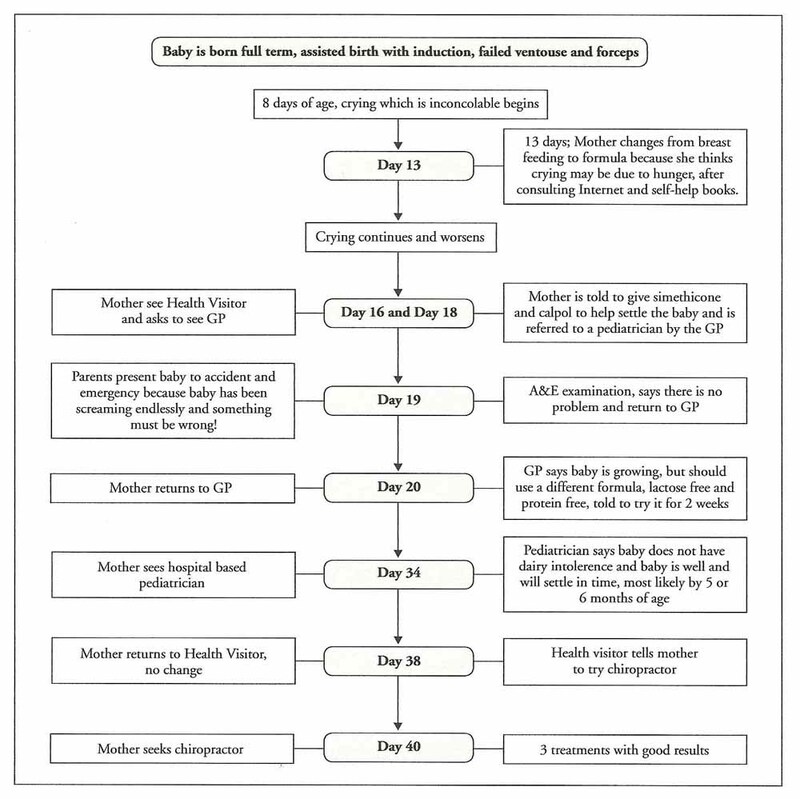 [15–17] This table demonstrates the potential costs of a cohort of colicky infants in a possible flow-through typical types of health care along with potential costs of infant colic including change in feeding, stoppage of breast feeding and even non-accidental injury. Costs have been added for a total potential for routine costs that might accrue in a cohort of afflicted infants. Mean of 4 chiropractic treatments (£14.50/treatment) for child at £58/child = £5,800. If this were extrapolated to the entire cohort, the cost for chiropractic care for every child who suffered from infant colic in 2010 would be £14,278,500 (approximately $22 million) for an episode of manual treatment. This cost resulted in an average of 2.6 hours reduction in infant crying, bringing the weekly crying to a “normal” amount which is less than a colic diagnosis. The cost of manual therapy per hour reduction in crying was £33 ($51). Manual therapy has been found to be cost-effective in other studies. [21–24] However, there has been no attempt at investigation of a cost-benefit analysis of chiropractic manual therapy for the treatment of the infant inconsolable nocturnal crying infant syndrome (a proposed moniker to replace the outdated term, infant colic). If examination by the GP to determine that no other illnesses were present and if no further treatment beyond manual therapy were sought, this could result in a savings of £50,721,500 in 2001 (approximately £60 million in 2012 [USD 96 million]). The annual cost of manual therapy is approximately equivalent to the annual cost of the most common drug treatment, simethicone alone at current rates. Although the two treatments, simethicone and manual therapy cost approximately the same, three double blind studies show no effectiveness for that medication [15–17] while manual therapy has shown moderate effectiveness for the condition. Of course, a £60 million savings is a small number compared to the NHS annual budget of £104 billion in 2010  and perhaps should be looked at more in light of helping families than pure economic savings. It is, perhaps, difficult to contemplate a deviation of care from the well-established medical model with all of its advanced technological capabilities and resources, particularly in dealing with the needs of a newborn. Manual skills, which individualize variable palpatory pressures may uncover functional problems in the infant. The final common pathway of the gentle manual therapeutics used for infants is one of release, joint release when immobility is observed and myofascial release when a muscle is tonic. When these were factors preventing normal biomechanical actions in the child,(s)he tends to feel relief. Treatments are low-tech and thus, relatively, low cost. Chiropractic manual therapy (CMT) doesn’t include any usage of drugs or medications. However, CAM users are more likely to be medication users as well. [19, 20] This would raise the costs of an episode of care; it should also alert CAM practitioners that the child could be suffering from a side-effect from medication and this should be carefully observed. Cincotta and colleagues  pointed out that there is potential for cross-reactivity in medications with CAM herbal or homeopathic remedies (anything that is taken internally) and that this isn’t an issue with purely mechanical therapies such as chiropractic and this is one less risk with manual therapy. Herbal and homeopathic medicines have shown life-threatening episodes with infants. [30, 31] Likewise, Birdee and colleagues  stressed concern of drug/herb interactions as over-all CAM use was associated with medication use in the last three months and this might lead to significant adverse effects. There are limitations to this study. It is linked to a RCT and although this is a common method to determine cost effectiveness, it is not the only method. It should be kept in mind that any specific therapy may be part of a bundle of therapies and total costs may be difficult to unpick. The main limitation in cost-effectiveness studies is the accuracy of the data upon which the review is based. In this case, the review is completely transparent, so that if any new costs surface, they can be added or changed. Anyone who feels that some types of care are not routinely accessed can simply delete them from the estimate. As usual, caution should be used when interpreting these data as with any very large numbers, there is room for considerable inaccuracy and these should be looked upon as trends as much as specific numbers. The trends, however, are quite clear. The costs of the excessively crying baby are very high and a small demonstration project study may be warranted to determine whether chiropractic manual therapy continues to show promise in reducing these costs whilst providing relief for the child and family. Once an infant is determined to be healthy and suffering from no illness, the most cost-effective choice may be a short trial of chiropractic manual therapy. So far, the performance of manual therapy is better than other treatments and in a worst case scenario, a baby not helped for this condition, has extremely low risk of coming to any harm with this type of therapy. Towards evidence based medicine for paediatricians: But at what cost? The role of cost-effectiveness in U.S. vaccination policy. New England Journal of Medicine 2010;10.1056/NEJMp1110539. NEJM.org. Morris S, St James-Robert I, Sleep J, Gillham P.
Economic evaluation of strategies for managing crying and sleeping problems. Papousek M and von Hofacker N.
Persistent crying in early infancy: a non-trivial condition of risk for the developing mother-infant relationship. G room C, Jolliffe C, Miller J, Nylund C, Wilson A. Cost effectiveness of chiropractic treatment for infant colic. McCallum SM, Rowe HJ, Gurrin LC ,Quinlivan JA, Rosenthal DA, Fisher JRW. Unsettled infant behaviour and health service use: A cross-sectional community survey in Melbourne, Australia. Hollinghusrt S, Redmond N, Costeloe C, Montgomery A, Fletcher M, Peters TJ, Hay AD. Paracetamold plus ibuprofen for the treatment of fever in children (PITCH): economic evaluation of a randomised controlled trial. Wolke D, Rizzo P, Woods S.
Persistent infant crying and hyperactivity problems in middle childhood. Reijneveld SA, van der Wal M, Brugman E, Hira Sing R, Verloove- Vanhorick S.
Vandenplas Y, Brueton M, Dupont C, Hill D, Isolauri E, Koletzko S, Oranje AP, Staiano A. Guidelines for the diagnosis and management of cow’s milk protein allergy in infants. Freedman SB, Al-Harthy N, Thull-Freedman J. The crying infant: diagnostic testing and frequency of serious underlying disease. Miller J, Newell D, Bolton J. A national approach for child protection – Project Report Commissioned by the Community and Disability Services Ministers’ Advisory Council. Effectiveness of treatment for infantile colic: systematic review. Husereau D, Clifford T, Aker P, Leduc D, Mensinkai S.
Ottawa: Canadian Coordinating Office for Health Technology Assessment; 2003. Dobson D, Lucassen PLB, Miller J, Vlieger, AM, Prescott P, George Lewith G.
Manipulative therapies for infant colic. Yussman SM, Ryan SA, Auinger P, Weitzman M.
Visits to complementary and alternative medicine providers by children and adolescents in the United States. Birdee GS, Phillips RS, Davis RB, Gardiner P.
Factors associated with pediatric use of complementary and alternative medicine. Doran CM, Chang DHT, Kiat H, Bensousssan A. Review of economic methods used in complementary medicine. Cost-utility analysis of osteopathy in primary care: results form a pragmatic randomized controlled trial. Gurden M, Morelli M, Sharp G, Baker K, Betts N and Bolton J. Evaluation of a general practitioner referral service for manual treatment of back pain and neck pain. Expenditure on Healthcare in the UK,. Office for national statistics. [Online] 2 May 2012. Cincotta DR, Crawford NW, Lim A, Cranswick NE, Skull S, South M, Powell CV. Comparison of complementary and alternative medicine use: reasons and motivations between two tertiary care children’s hospitals. Aviner S, Berkovitch M, Dalkian H, Braunstein R, Lomnicky Y, Schlesinger M.
Use of a homeopathic preparation for “infantile colic” and an apparent life-threatening event. Saper RB,Kales SN, Paquin J., et al. Howard CR, Lanphear N, Lanphear BP, Eberly S, Lawerence RA. Parental responses to infant crying and colic: the effect on breastfeeding duration. Ball TM and Wright Al. Health care costs of formula-feeding in the first year of life. Taylor RR, Sladkevicius E, Panca M, Lack G, Guest JF. Cost-effectiveness of using an extensively hydrolysed formula compared to an amino acid formula as first-line treatment for cow milk allergy in the UK. Hollinghurst S, Redmond N, Costeloe C, Montgomery A, Fletcher M, Peters TJ, Hay AD. Paracetamol plus ibuprofen for the treatment of fever in children (PITCH): economic evaluation of a randomised controlled trial.